Feed on a variety of aquatic and shore plants, buds and roots and surviving in winter by eating bark . Live in ponds, lakes, rivers and marshes in North America, parts of Europe and Asia . Create dams in rivers and streams which provide them with still, safe water in which to build its lodge. The family will live inside the lodge in the centre of the still pool of water. 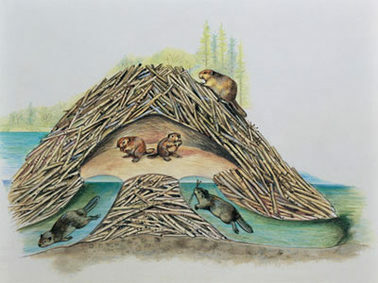 Lodges are made of branches and mud and hard enough for predators not to penetrate them. Have poor eyesight, but a strong sense of smell and good hearing. Have transparent eyelids so that they can see underwater with their eyes shut. Have sharp teeth which continue to grow throughout their life. Must gnaw on objects to keep their teeth at a manageable length or their teeth would eventually grow into their brain. Can hold its breath underwater for 45 minutes. The biggest dam built by beavers is twice as long as the Hoover Dam.